All kidding aside, scientists have found signs that those cute little creatures with feathers have something that resembles grammar as we know. Based on a report published by New Scientist ((Source)), Bengal finches have their own syntax when they chirp, sing, tweet, or whatever you want to call it. While the birds do not have the same concepts that we humans (such as the parts of speech – nouns, pronouns, verbs, adjectives, adverbs, etc. ), they have syntactic structures. By the way, syntax is defined as the ” is the study of the principles and rules for constructing sentences in natural languages.” ((Wikipedia)) Basically, the birds having a syntax of their own means that they have rules that govern their “speech”. Grammar falls under syntax. I suppose that this is not a totally new concept and that, in fact, many people have suspected this for the longest time. The breakthrough is that researchers from Kyoto University in Japan have actually found some proof that this suspicion might be true. 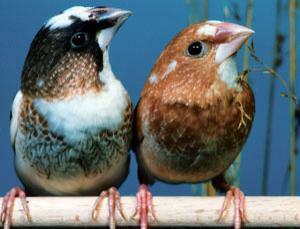 What the scientists did was to play various songs until the finches got used to them – or understood them. They then jumbled up the syllables in the songs and observed how the finches reacted. What they found out was that only one of the four jumbled up songs made the finches react in an adverse manner. The scientists say that based on the finches’ reactions, it seemed that the particular song broke the birds’ grammar rules – whatever those rules may be. And if you are thinking if it was just coincidence, give the researchers a little more credit, will you? They did the experiment on many birds and they had the same reaction – at least those birds who were exposed to other birds. That last bit seems to support the idea that the grammar rules are not innate in the finches. They have to learn the rules – just like we humans do. I don’t know about you, but I find the study – and its results – fascinating. Maybe these birds can teach humans to follow grammar rules a little more on Twitter. You know what I’m saying?